During the last 20 years yields of clean beet and sugar in the UK have been increasing linearly, at an average annual rate of 0.48 tonnes per hectare of beet and 0.01 t/ha sugar. Now the aim is to increase the average yield from just over 50 t/ha to 70 t/ha beet (adjusted tonnes). This raises the question of whether the currently recommended amounts of potash are adequate to achieve this target, especially as the recommendations are largely based on results of experiments that are 30-40 years old. In this revised leaflet, we use data from recent experiments, in which yields exceeding 70 t/ha adjusted beet were obtained, to re-examine the recommendations for potash. Potassium (K, usually referred to as potash: K2O) is an essential nutrient for all living organisms. 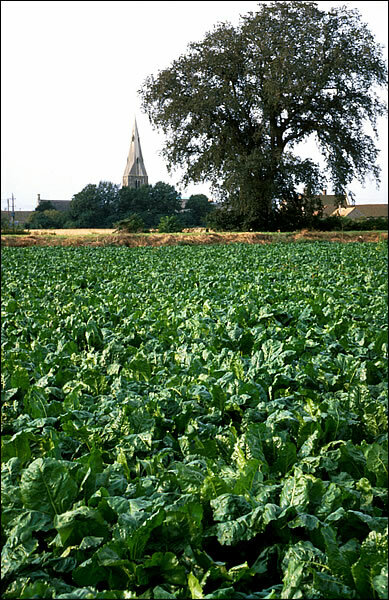 For sugar beet, adequate amounts of K must be available in the soil for the uptake by roots to enable crops to achieve large yields of acceptable quality. Potassium also enhances the ability of plants to resist stress from diseases and pests, and cold and drought. Potassium performs these roles in all crops, so it is important to ensure adequate K for all crops grown on the farm. It is now well established that plant-available reserves of potassium and phosphorus (P, phosphate: P2O5) can accumulate in most UK soils. Applications of both fertilisers and organic manures containing P and K contribute to these reserves. Maintaining an appropriate level of plant-available P and K in the top-soil is important because it ensures that growing roots can access sufficient P and K to meet the changing needs of a crop during the growing season. These reserves can be estimated by soil analysis and a soil can be assigned to a P and K Index, as in RB 209. The Index relates to the soil and not to the crop. Its value indicates the level of plant-available K in the topsoil with the number increasing as the level of plant-available nutrient increases (see leaflet 24 Soil Analysis). 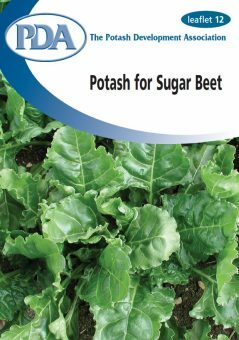 The needs of sugar beet for potash and its responses to this nutrient are summarised on the next page. Each of these points is discussed in more detail in the following sections while the role of K in plants is addressed at the end of the leaflet. Some of the recent data used here are from six years of trials on two sites which have soils with a wide range of long-established K Index values within a single field. One is on the silty clay loam at Rothamsted, the other on the sandy loam at Woburn. The aim was to check whether modern high-yielding varieties of sugar beet require more K to achieve maximum yields of beet and sugar. The experiments were funded by the British Beet Research Organisation (BBRO) and done by British Sugar plc and Rothamsted Research. 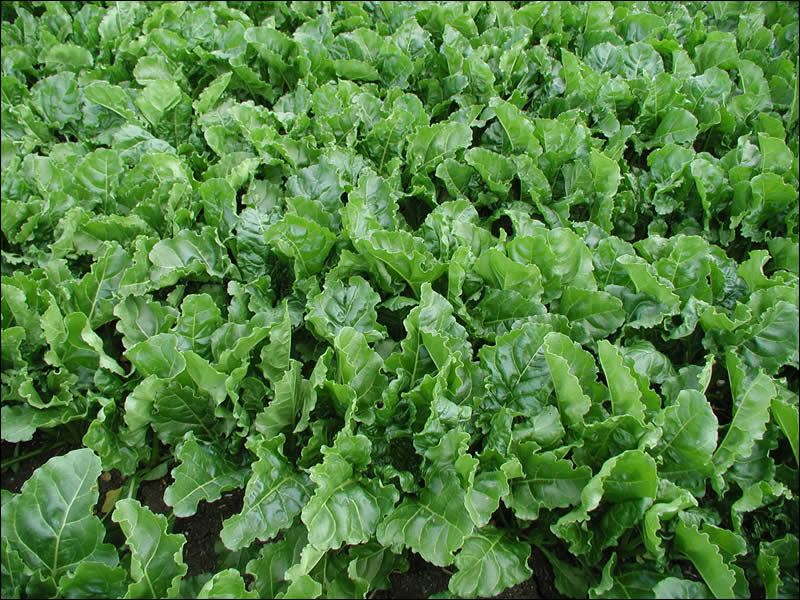 Potassium (K, potash: K2O) is essential for all crops and sugar beet requires large amounts. Soils should be maintained above the critical level for plant-available K, P and Mg to achieve optimum yields and quality of all the crops grown on the farm. For sugar beet, the critical level for potash is K Index 2-. Below this level, yield will be lost. Yields are not increased when soils are at K Index 3 and above. Crops need K where the roots can get it, i.e. throughout the soil explored by the roots. Sugar beet only very occasionally responds to freshly applied potash, and then only on soils with very low levels of available K (K Index 0). It is wise to regard applications of potash as part of the longer-term strategy to raise or maintain soil K at a suitable level rather than as a means of immediately increasing beet yields. Potassium in the ploughed-in tops is returned to the soil K reserve. To maintain adequate levels of soil K, the K removed in the harvested beet needs to be replaced on all soils below K Index 3. The quantity removed can be seen for individual contracts from British Sugar On-line. Sugar beet requires a small amount of sodium (Na). In addition sodium can substitute for some of the functions of potash; applying Na will be of benefit on K Index 0 and 1 soils and on soils low in available sodium. REMEMBER: Once soil K has been adjusted to above the critical level it needs to be maintained at that level. 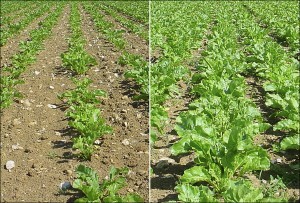 This can be done by estimating the amount likely to be removed in the harvested beet before the sugar beet is sown or replacing the amount removed before the next crop is sown. Either way, the actual K status of the soil needs to be checked by soil sampling and analysis every 4-5 years. Because the K status of the soil can vary widely within a field, growers may wish to maintain their average soil K index closer to 2+. Chart 2: Root and sugar yields vs. soil K status on a silty clay loam at Rothamsted (solid symbols) and a sandy loam at Woburn (open symbols). 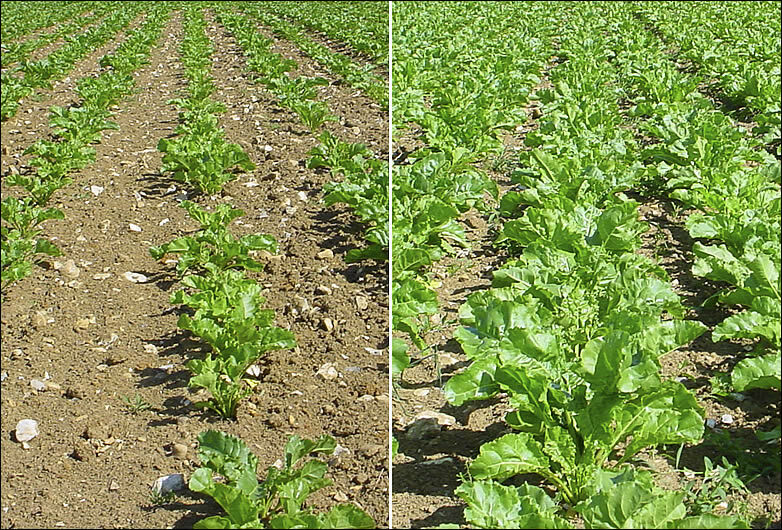 In the experiments at Rothamsted and Woburn, yields of clean beet and sugar increased as the availability of soil K (K Index) increased. Maximum sugar yield was achieved on plots which were at K Index 2- or above in all six years, both on the silty clay and the sandy loam soil. Sugar yields were greatly decreased when the K Index was below this critical value because the lack of plant available K decreased both the yield of clean beet and the sugar content (% sugar). The responses of sugar beet to soil K (K Index) in these recent, highly definitive experiments are very similar to those from experiments done in the 1970s. They show that the existing recommendations on K fertiliser use in RB 209 and the BBRO Growers Guide do not need to be changed greatly for modern, higher yielding sugar beet crops. 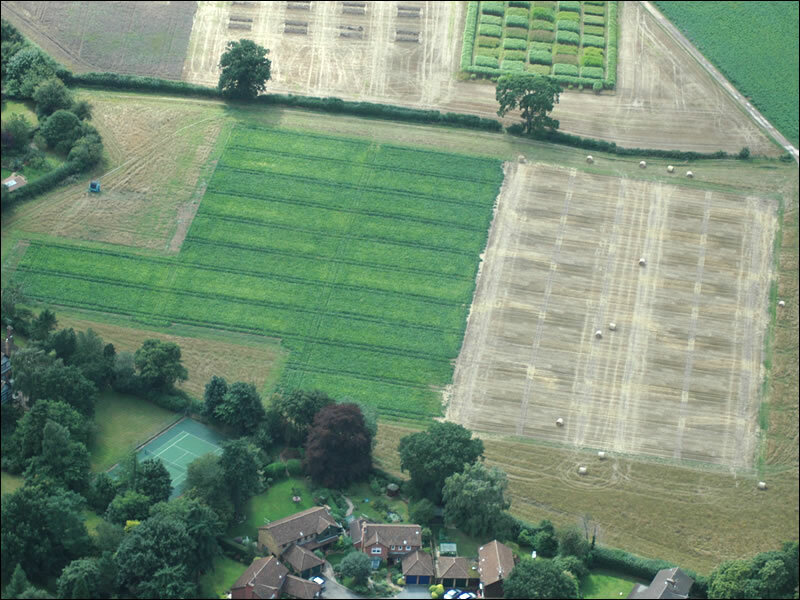 In these experiments, as well as British Sugar’s more extensive trials on soils of widely ranging K Index, there were no yield responses to freshly-applied fertiliser K at any level of soil K, even on low Index soils on which responses might have been expected. 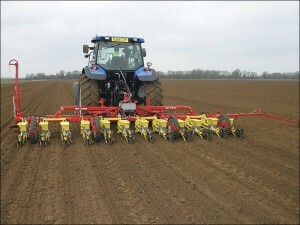 In part this is because it is difficult to mix freshly applied K evenly into the top soil by cultivation. Chart 3: Potassium uptakes and offtakes vs. soil K status on a silty clay loam at Rothamsted (solid symbols) and a sandy loam at Woburn (open symbols). Sugar beet has a large requirement for K. Chart 3 shows the total crop uptakes and offtakes of K in the harvested beet of the crops whose yields are shown in Chart 2. Where maximum yields were achieved at soil K Index 2- (i.e. 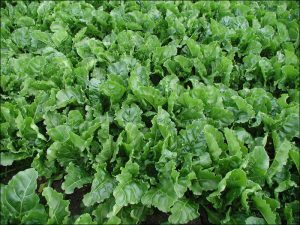 120-180 mg K/litre) the corresponding uptake into the crop was 420-480 kg K2O/ha of which 90-100 kg K2O/ha was in the harvested beet and therefore removed from the field. On soils with plentiful K, the uptakes and offtakes of K can be much larger than this optimal requirement (i.e. up to 600 kg/ha in the crop and 150 kg K2O/ha removed, respectively). Extra K in the roots, however, does not increase clean beet or sugar yields; it serves only to decrease beet quality. Chart 4: The uptakes of potassium into the sugar beet crop during growth. Much of the K needed by the crop is taken up during the early months of growth (Chart 4). However, more than 70% of it remains in the tops at harvest, and will be returned to the soil if the tops are subsequently ploughed in. Although the amount of K removed in harvested beet is comparatively small, it still has to be replaced to maintain the soil at an appropriate K Index. Therefore, current fertiliser policy should be based on the long-term aim of achieving and maintaining the soil at least at K Index 2-. For soils at Index 2- (120-180 mg K/litre) and 2+ (180-240 mg K/litre) only maintenance dressings need be given to replace the K removed in the beet. Where soils are at Index 0 or 1, extra K needs to be applied in addition to the maintenance dressing to build up soil reserves. On light textured soils, such as sands, that have too little clay to hold much K, the K will need to be applied for each crop in the rotation. On soils of K Index 3 and above, no maintenance or build-up dressings of K need be applied. In the past the quantity of K removed in the harvested beet, which is needed to calculate the maintenance dressing (M), had to be estimated approximately, from the guideline that each tonne of beet harvested from the field contains 1.7 kg K2O. A new service is now available at British Sugar On-line that calculates how much K2O is present in beet delivered to the factory. The calculation normally relates to the contract as a whole but can be related to specific fields if growers schedule their deliveries on a field by field basis. This is a unique service for sugar beet growers which should help them ensure that the correct amounts of potash are returned to each field. * This is a general estimate for the maintenance dressing. As indicated, individual growers can obtain more accurate offtakes from British Sugar On-line. For soils at K Index 2- there are several potential benefits to be gained by applying the necessary K, Na and Mg in the late autumn and early winter prior to ploughing the land destined for the beet crop. Sugar beet has active roots at depth, but the main advantage of such early spreading is that the absence of newly applied nutrients in the seedbed is helpful to germination and the establishment of a good plant population. The fact that there will be no wheel-marks in the seedbed from the spreading and incorporation of these nutrients is another significant benefit. However growers on light-textured sandy soils with low clay content should be aware that it may be difficult to raise a low soil K Index even up to Index 2-. 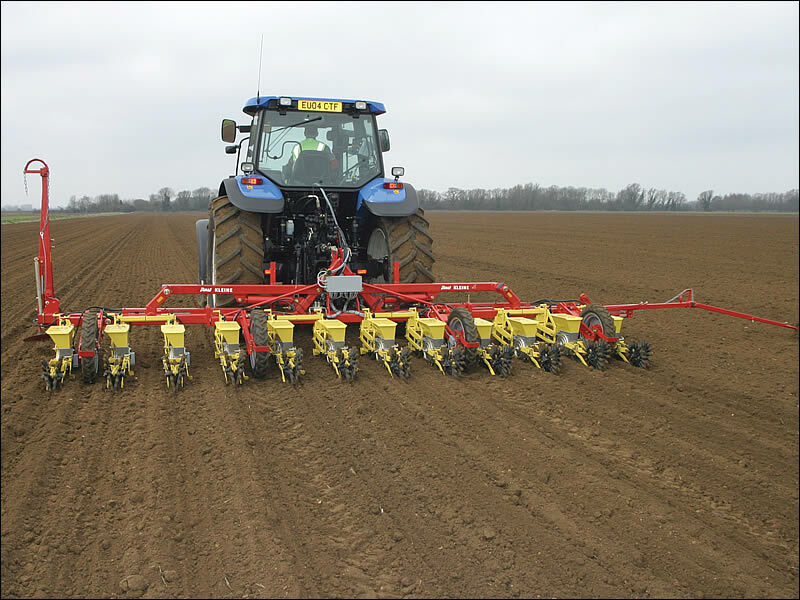 In this situation it is better to apply the appropriate amount K for the crop in the early spring after ploughing and for this K to be well incorporated by cultivation. It is not recommended to apply large ‘rotation manuring’ dressings of K to these soils. 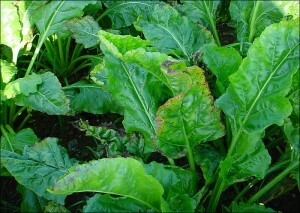 Sugar beet has a specific requirement for sodium (Na) in addition to K, for growth. The crop usually takes up about 50 kg Na/ha on a soil well supplied with K, an amount much less than that of K. Most of the Na is retained in the tops where it is mainly used to sustain the growth of the leaf canopy. On soils very low in K (Index 0-1), Na can replace K in its role of maintaining cell turgor. Sodium is usually applied as agricultural salt, Sylvinite or Kainit, the latter two supplying both K and Na and some Mg. Soils can contain Na deposited in rainfall. These three plant nutrients are available in a number of sources from which they are readily available for uptake by plant roots, especially from the inorganic materials. * The content varies slightly in these naturally occurring materials. ** For more details see RB 209. Where organic manures are applied to soils at K Index 2- and above, the amount of K applied in the manure should be deducted from the recommended amount of fertiliser K. For soils at K Index 0 and 1, the manure K will help to increase soil K reserves and thus improve soil fertility. Potassium has several roles in plants. It is essential for the activation of some enzymes within the cell. Only a small proportion of the total K in plants is required for this, perhaps 20% in cereals for example, but in these roles it cannot be replaced by any other element. Much more K is required to fulfil other major functions in plants. In these roles the plant prefers to use K rather than other elements like sodium and calcium. For this reason the plant must have a sufficient supply of K available to it because it will take up large quantities of K from the soil during growth. Potassium is essential for growth and is the main element used to maintain cell turgor (rigidity) and to regulate the water content of the plant. Potassium is also involved in controlling the opening and closing of the stomata (the openings in leaves through which water is lost by transpiration and carbon dioxide enters the leaf to be converted to plant dry matter and sugar). The importance of cell turgor cannot be over-emphasised. For maximum sugar yield it is essential to optimise the interception of solar radiation (sunlight) to provide the energy for the conversion of carbon dioxide to sugars. This requires a rapidly expanding leaf canopy. Nitrogen (N) supply drives the rapid production and expansion of cells. These rapidly expanding cells require K to obtain water and maintain their turgor. Green plants often contain more K than N.
Potassium also has another equally important role in the transfer of sugars produced in the leaves to the storage root. In its passage from leaf to storage root each molecule of sugar has to pass through innumerable cell membranes, and K+ ions are an essential component of the ‘molecular pump’ within the cell membranes that facilitate this passage. The role of sodium (Na; common salt is sodium chloride, NaCl) in sugar beet nutrition is interesting. At one time it was thought that K and Na were totally interchangeable in their functions in the nutrition of beet, but recent work shows that this is not entirely correct and that there are important differences. Sugar beet has a specific, irreplaceable requirement for Na and usually takes up about 50 kg/ha on a soil well supplied with K. Most of this Na is retained in the tops where it is used to mainly to sustain leaf growth and canopy development. A rapidly expanding leaf canopy is essential to intercept incoming radiation effectively and to drive sugar production. 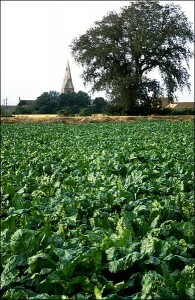 The other role for Na in beet relates to it being descended from wild beet that grew in maritime environments where there were large amounts of Na and little K. In this environment the plant adapted to use Na as well as K to maintain cell turgor and would take up proportionally more Na than K. Modern cultivars of sugar beet descended from these wild forms have retained the ability to use Na as well as K in regulating cell turgor. Thus today on K Index 0 and 1 soils that contain too little K for maximum yield the plant will take up Na early in growth to make up for the limited supply of K. This will enable the regulation of cell turgor and the water content of the crop to optimise the rapid development of the leaf canopy. Where there is certainty that the plant-available supply of K is adequate throughout the depth of soil explored by roots then this additional Na is not needed by the crop as a replacement for K. However if it is present in soil then, like K, it has no adverse environmental impact. Magnesium (Mg) is an essential constituent of chlorophyll, which gives leaves their green colour. Chlorophyll is involved in the conversion of carbon dioxide to sugars and Mg also has a role in protein synthesis. Soils at Mg Index 2 and above usually contain sufficient plant-available Mg to meet the needs of the crop. On soils of Mg Index 0 and 1, Mg should be applied. When adequately supplied with Mg there is about twice as much in the tops as in the roots, so most of the Mg taken up by the crop is returned to the soil when tops are ploughed in.